Zack Richard is an American film director and cinematographer. His body of work consists of cinematography for feature films, music videos, commercials and directing music videos. Zack is a consummate professional – calm, intuitive, efficient and responsible. Zack has received numerous awards and commendations throughout his career and is renowned for his creativity and ability to meet and exceed the expectations of his clients. Zack is an experienced RED EPIC cinematographer and owner of an RED EPIC-M camera package. Zack Richard’s work in both photography and video production truly showed his talents, but his outdated website did little to give his work the real justice it deserved. His hard work and passion over the years needed a site that would showcase his work in a clean and effective way. 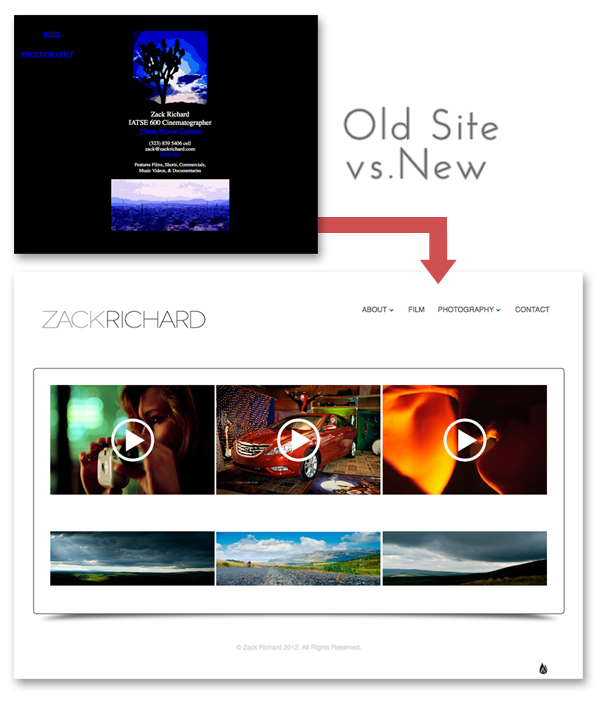 Zack’s website focus needed to be his work in video production and photography, an easy to use interface that would encourage people to view his collection of work, not deter them from it. Develop an identifiable mark for the Zack Richard name. Create an effective design that showcased Zack’s work, not distracted from it. Bring the quality of his web presence up to the quality of his work.